The first written record of rabies appeared in the Mesopotamian Codex of Eshnunna ca. 1930 BC.1 This disease has plagued societies in Africa, the Middle East and Europe from ancient times. More recently, it has spread to most areas of the world, via the process of colonisation. Caused by a lyssavirus, dog-associated rabies remains a major public health issue in Asia and Africa. In humans it is almost inevitably fatal, following a severe illness that can include hydrophobia, paranoia, hallucinations and terror. Rabies likely was introduced to Indonesia during the 1880s, probably via importation of dogs from Europe.11 Despite quarantine laws and attempts to control the disease, rabies spread within two to three decades throughout the Greater Sunda islands (Java, Sumatra, Borneo, and Sulawesi). Within the past two to three decades, more and more islands have reported rabies outbreaks, particularly in eastern Indonesia: Ambon, Flores and Bali have recently been affected by rabies incursions and rabies currently threatens Lombok. Rabies was recently (2006−2007) reported from Maluku.11 In 2010, rabies was reported from Larat Island in West Maluku Tenggara, <500km north of the Tiwi Islands and the Australian mainland (west Arnhem). Unless this spread is controlled, it is likely that rabies will enter Irian Jaya and then Papua New Guinea, or Timor. Regional spread via fishermen’s dogs is suspected,11 although movement via the trade in dogs as pets, for hunting and for food is likely another driver of rabies spread in this region. A large scale rabies epidemic could occur in an area of low human population, probably along the northern coast, and would involve wild and feral dogs.13 At the high densities of wild dogs and dingoes found in northern Australia, dog rabies would likely persist were it introduced.15 Interaction between free-roaming dogs and feral dogs and dingoes would be the most likely avenue for dog rabies transmission to humans. To inform preparedness and response plans, a research program was commenced in 2012 that integrated field observational studies with disease spread simulation. 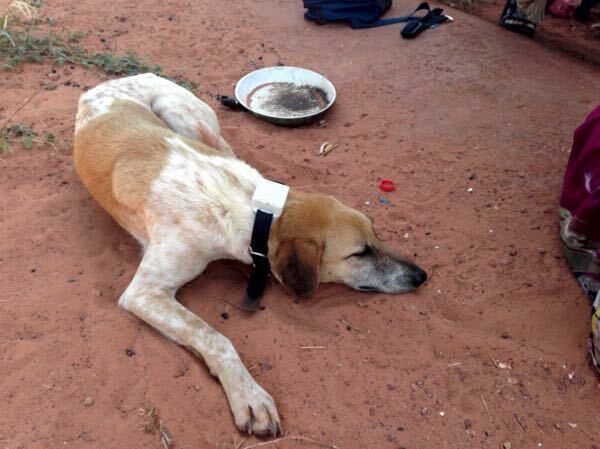 To estimate the rate at which dogs contact each other within and between indigenous communities in northern Australia, GPS tracking devices have been used. Detailed methodology has been presented by Dürr and Ward.17 Compact GPS units were attached to regular nylon dog collars (Figure 1), and have been deployed over periods ranging from days to months, in communities in East Arnhem (NT), the Katherine region (NT), the Northern Peninsula Area (QLD) and the Torres Strait. GPS data recovered from these GPS units (Figure 2) have been used to estimate the dogs’ home ranges. This process is performed using a Biased Random Bridge method, which provides information on where and for what periods each dog utilises the landscape (i.e. its 50% and 95% isopleth utilisation distribution). These are referred to as core and extended home ranges, respectively. Figure 1. A community dog with a GPS collar deployed. Figure 2. 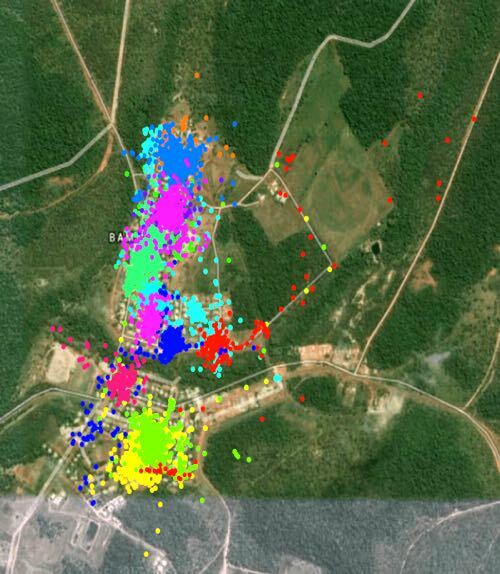 GPS data recorded from 10 community dogs in Bamaga QLD. Most dogs have been found to have compact home ranges, in the order of <1 ha core home range. However, some dogs have been found to roam widely, 10 ha or more. Also, human-mediated transport has been recorded, for example between communities and for the purpose of hunting. Predictors of roaming have also been investigated; it has been found that home ranges can be greater in the dry season, and for male intact dogs. Most importantly for planning for a rabies incursion, this data has been used to estimate how frequently dogs come into contact within these remote, indigenous communities in northern Australia. A state-transition disease spread model has been developed and parameterized.18 Individual dogs are the unit of interest; at any point in time they can exist in only one of four mutually exclusive states: susceptible (S) to rabies infection; latently-infected (E); infectious (I); and removed (R). A novel component of this SEIR model is the representation of dog behaviour to define likelihoods of infection. Preliminary modelling suggests that vaccination is the most efficient approach to controlling a rabies incursion in these communities. Importantly, reactive vaccination (in response to an outbreak, once detected) is as efficient as pre-emptive vaccination (ahead of an anticipated incursion). Culling of dogs and movement bans in general do not have a major impact on the outcome of an incursion.